2) Food (normally in the form of cellulose, found in products such as drywall and wood). Mould is a type of fungus that grows and reproduces rapidly, producing mould spores. The spores are distributed throughout your home via furnace ductwork. Mould can cause significant structural damage to your home if not taken care of quickly. Mould could be growing inside your walls with very little signs on the surface. Some moulds are toxic, while others cause allergic reactions. Some of the many symptoms of exposure to mould include cough, nose bleeds, headache, fever, rhinitis and dermititis. 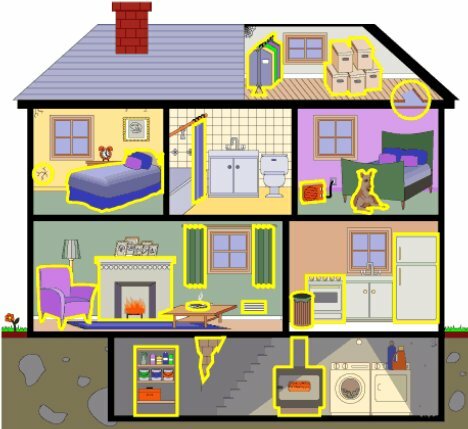 There are over 270 species of mould that have been identified in Canadian households. "Testing is generally not recommended for homeowners. Testing of moldy materials or an air sample identifies the types of molds that may be present but does not identify the cause/source of moisture. The type of mold does not change the procedures for cleaning up areas of mold less than 3 square meters. You have to clean up the mold and correct the problem irrespective of the type of mold. The cost of testing may be better spent hiring a professional investigator or fixing the problem." Formaldehyde is a colorless, flammable, strong-smelling chemical that is used to manufacture building materials and to produce many household products. Today, it is used in pressed-wood products, such as particleboard, plywood, and fiberboard; glues and adhesives; permanent-press fabrics; paper product coatings; and certain insulation materials. Formaldehyde has been classified as a known human carcinogen. Called “plasticizers,” phthalates are a group of industrial chemicals used to make plastics more flexible or resilient. Phthalates have been found to disrupt the endocrine system, causing birth defects. Several phthalate compounds have caused reduced sperm counts, testicular atrophy and structural abnormalities in the reproductive systems of male test animals, and some studies also link phthalates to liver cancer. Many products in your home contain phthalates. PCBs have been banned from use, and their concentrations are reducing in humans over time. So nothing to worry about right? Wrong. A new chemical has come along to take their place. BFRs are added to materials to both inhibit their ignition and slow their rate of combustion They are applied to prevent electronics, clothes and furniture from catching fire. They have known toxic properties, are highly resistant to degradation in the environment and are able to bioaccumulate (build up in animals and humans) adversely affecting health. Undiluted, ammonia is a severe eye and respiratory irritant that can cause severe burning pain, and corrosive damage including chemical burns, cataracts and corneal damage. It can also cause kidney and liver damage. Repeated or prolonged exposure to vapours can result in bronchitis and pneumonia. Found in a wide range of cleaning products. Ammonia will react with bleach to form poisonous chlorine gas that can cause burning and watering of eyes, as well as burning of the nose and mouth. Parabens are hormone disruptors. Widely used in cleaning products as preservatives, paraben is usually preceded by the prefixes methyl-, ethyl-, butyl-, or propyl. Parabens may cause contact dermatitis in some individuals.